Watch Reading Circle Charts to hone your chart reading skills. Use these circle charts to answer questions 1 - 4. 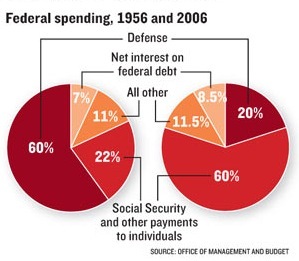 Notice that the chart on the left is the 1956 Federal Budget. The chart on the right is the 2006 budget. 1. What program is the greatest portion of spending in 1956? How has the spending for that program changed in 2006? How much has that spending changed from 1956 to 2006? 2. Which item was the least spending in 1956? How has that spending changed by 2006? 3. Which program has had the greatest increase from 1956 to 2006? How much has it increased? divide the money up using the percentages shown in the 2006 chart. Find out what your state's government spent in 2006 on two of the items. How does it compare with federal spending? On what program does your state spend the most money? How would you determine how much this spending has grown over the last 3 years? What factor(s) should determine the growth in government spending? Make a circle chart showing the 4 largest expenses in your county's or city's budget, for this fiscal year. Which expense had the greatest increase in spending over last year? Make a circle chart showing the 4 largest expenses of your school district's budget, for the current school year. (Budget information is public info. Call the district office and speak to the business manager. What item is the greatest portion of spending? Save a tree - use a digital answer format - Highlight the text. Copy it. Paste it in a word processing document. Save the document in your folder. Put your name and the date in a header. Answer on the word processing document in a contrasting color (not yellow) or font (avoid symbol, , or other ornate artistic fonts). Save frequently as you work. I do not like losing mine. You will not like it either. Enter your name and the date in a document header. Submit your response via a class electronic drop box or email. Bad things happen: Save a copy of your work on your computer. Or perhaps you have the resources to record verbal answers. If you do, be sure to first read / record the question. Then record the answer immediately after it. Make your own answer sheet. | Proof read your responses. It is funny how speling errors and typeos sneak in to the bets worck.